JS/ScrInject.b is the PUP that uses misleading techniques to prevent removal. Use Reimage to locate malicious components and get rid of them faster than with uninstall instructions. A full system scan blocks virus reappearance and prevents traffic to malicious domains. What should you know about JS/ScrInject.b virus? How can this Trojan infiltrate your computer? JS/ScrInject.b Trojan. How to remove? JS/ScrInject.b virus is a new threat in the category of Trojan viruses. Similarly to other Trojans, such as Trojan.ZeroAccess or 12Trojan.Win32.Krepper.ab, this malicious program enters computers along with other malware programs. Of course, the JS/ScrInject.b hijack occurs stealthily, so the user has no idea about the infiltration. 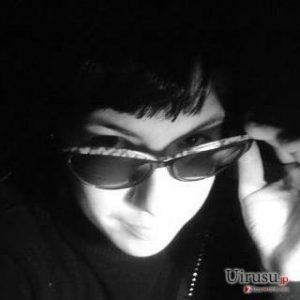 This way, the Trojan can secretly carry out its activities in the background of the system. The security experts warn that JS/ScrInject.b can bring serious damage to the infected computer by targeting its defense system. It goes without saying that this program should be terminated immediately. However, Trojans are usually very well hidden deep in the computer’s system, so there is little change you will be able to detect and remove JS/ScrInject.b by yourself. For this purpose, it is advisable to use professional antivirus software, such as Reimage, and run a thorough system scan with it. 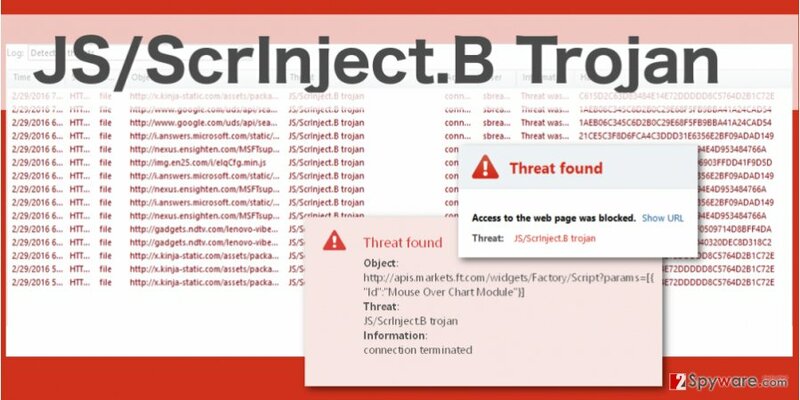 Essentially, JS/ScrInject.B Trojan works as a gateway for other viruses to enter the computer. 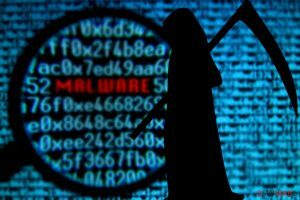 It may install additional adware, browser hijackers and other viruses which significantly slow down the system’s performance, causing a variety of errors and malfunctions. Eventually, because of the heavy CPU and RAM load, the PC’s defense mechanisms will fail. If the Trojan manages to stay in the computer’s system long enough, it may redirect the infected computer to some remote server, easily handing down the access of your system to the online criminals. It is not surprising that these hackers will do their best to extort as much benefit out of this opportunity as possible. They may install cookies to track your online purchase information, login details used for e-banking and use this data for commercial purposes, or to steal your money. It is undeniable that JS/ScrInject.B removal is inevitable if you want to keep using your computer safely and uninterruptedly. As mentioned before, the JS/ScrInject.b Trojan can infiltrate the computers along with other malware. It can be achieved via deceptively spreading malicious programs in software packages together with popular and frequently obtained programs. Such infectious software packages can be encountered on obscure software download sites, downloaded by clicking on pop-up ads displayed on some untrusted sites and received as a file attached to a spam email. Since there are a lot of ways you can get infected with the JS/ScrInject.b virus, you have to take care of the thorough system protection. Obtaining reliable antivirus or anti-malware tools is the fundamental step towards a guaranteed system security. Also, it is worth reconsidering your browsing habits and make sure you stay away from suspicious content you may come across on the web. If you suspect your computer could have been infected with JS/ScrInject.b Trojan, you should get rid of it immediately. Your personally-identifiable information, system files, and computer’s security may be at stake if you do not do that in time. You may remember that manual JS/ScrInject.b removal is a rather difficult process as the virus is hidden deep in the computer’s system. Not to waste your time, we advise you to use reliable anti-malware software to remove JS/ScrInject.b virus from your device quickly and effectively. This entry was posted on 2016-04-26 at 02:39 and is filed under Trojans, Viruses. You can quickly scan the QR code with your mobile device and have JS/ScrInject.b manual removal instructions right in your pocket. How did you remove JS/ScrInject.b?